The organization will live on under a different name. For some reason, Kim Kardashian thought is was her entitled responsibility to jumped into the beef on Twitter. She mocked Rhymfest for not being as famous as her and claimed he wore fake Yeezys. Most disturbingly, she threatened to “take” Donda’s House. 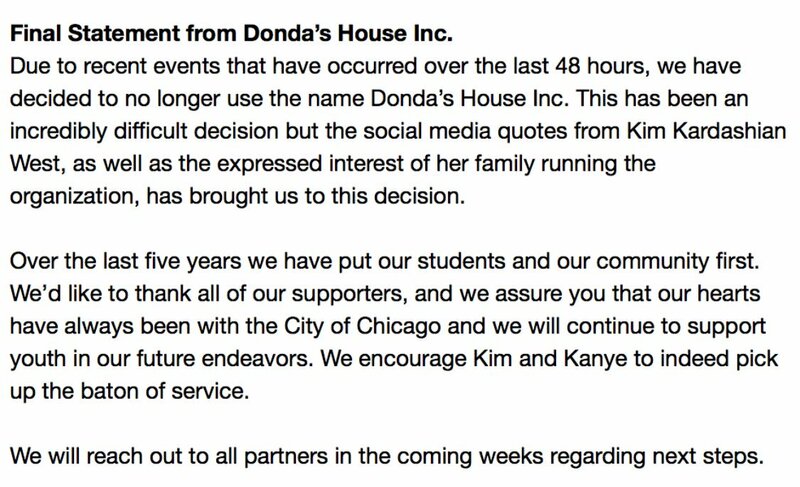 Donda’s House quickly responded, obviously terrified of Kim Kardashian colonizing an organization that has been helping young creatives in Chicago since 2011, saying the charity would make arrangements to no longer use the name Donda’s House, Inc. As of today, Donda’s House, Inc. is no more and, thankfully, Kim failed at trying to colonize the organization. What is even better is that Rhymefest, born Che Smith, and his wife Donnie Nicole Smith are still deeply involved in the charity. Smith is the co-founder and executive director of Art of Culture, Inc. Therefore, Kim Kardashian didn’t manage to “take” anything away from these Chicago natives who have been serving young people in Chicago years before she even laid eyes on Kanye West. Let’s hope people will continue to support Art Of Culture, Inc. even though it is no longer associated with Kanye. To learn more about Art Of Culture, Inc. and find out how you can support, click here. Donda West died on November 10, 2007 after complications during recovery from plastic surgery.